Native Watercraft is all about making kayaks with hybrid designs and rich feature sets, such as foot-powered peddle systems on their fishing kayak models. This company is dedicated to building high-quality adventure gear for those who like to explore the natural world in new and exciting ways. Native Watercraft as a company is filled with adventurers like you and me, who know the importance of quality outdoor gear. The features and functions found on Native Watercraft kayaks are designed with input from professional fisherman and adventure guides to ensure their quality meets the highest of demands. These fishing kayaks are some of the best on the market, used by professionals worldwide, and feature an extensive range of innovative features built upon extremely durable and lightweight materials. Kayaks that utilize rotational methods of molding are among those most resistant against impact and abrasion damages. Polyethylene materials have been well-known among kayak enthusiasts for providing long exposures to both UV frequencies (sunlight) and temperature variations. This accommodation allows for Native Watercraft kayaks to be stored outdoors without suffering damage. Another one of Native Watercraft’s patented technologies, Tegris kayaks are made with a type of specialized material known for toughness, aesthetics, and resiliency in elements. Tegris is made through a process that melds together layers of fabric without the use of resin, which creates the same durability as comparable materials but at a much lower overall weight. This material allows boats to carry large weight loads, be lightweight, and still maintain durability! In most kayak designs, when in a seated position, your feet are roughly on the same plane as your hips. This has been a fairly standard design concept for years, but Native Watercraft decided it was time to up the ante a bit and have made a tremendous improvement. By lowering the level where your feet rest inside the kayak body, Tunnel Hull designs allow for a greater accommodation for shifting loads around, standing for long periods of time, and adds a bit of extra rigidity to the hull. Coupled with the suspended seats found in most Native Watercraft kayaks, this design features is a major plus for these kayaks. This revolutionary seating system is shaped to the curvature of the hull design, allowing for easy shifting forwards and backward and has been designed to be suspended—rather than resting against the hull itself. The use of suspension technologies allows for a much smoother ride, especially when collisions are a part of the trip, and creates an ergonomic advantage allowing for much longer adventures. These seats are made of an anodized aluminum framing, combined with a patented Textilene Solar Screen Fabric that has been designed to withstand brutal exposure to sunlight and water without losing structural integrity. Native Watercraft is one of the few kayak companies making use of rudder and foot-powered propulsion systems that give you an extra edge in mobility and maneuverability. The rudder systems are managed by an onboard cable system that allows for the lowering and raising of the rudder based on conditions and intended usage. The foot-peddle powered propeller systems are utilized for providing forward thrust without the use of paddles. This is ideal for fishermen that need to move around while still maintaining a secure grip on their fishing rods. Both these systems are made of flexible and durable materials that are resistant towards impacts and abrasions. The Slayer Fishing Kayak series offers a solid line of easy and customizable kayaks with extreme stability for on-water maneuvering. Seating positions adjust to suit operator preference, as well as to accommodate different ergonomic styles. 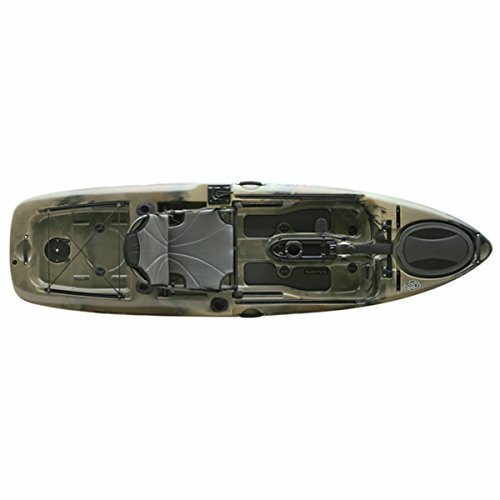 The Slayer Kayak comes with an open-top design, removable square dashboard, two flush-mount rod holders, a rear dry-storage hatch, padded carry handles, a tunneled hull design, and accommodations to ensure installation of fish finders is an easy process. There are three different models of the Slayer Kayak; the Slayer 12, Slayer 13, Slayer 14, and Slayer 10 Propel. Aside from the Slayer 10 propel, which comes with the foot-powered propulsion system, the main difference between these models are their sizes and weights. The Native Watercraft Ultimate, Ultimate FX, and Ultimate Propel series kayaks are what fisherman’s dreams are made of. These adventure crafts are among some of the lightest and most durable kayaks on the market and cater to specific needs of anglers. The Ultimate FX, for example, is the lightest peddle drive kayak on the market, designed with professional fishermen’s input, and has been designed from the ground up for serious fishing. The Ultimate Propel fishing kayak features an open-deck design, a built-in battery box to supply power to onboard electronics, hatch cover on the bow, built in traducers mount for fish-finder accommodation, ample under-seat storage space, and a ton of other exciting features. This kayak also includes the Propel Pedal Drive system which is capable of forward and reverse movements. Largely considered to be the market leader for high-quality fishing kayaks, Native Watercraft demonstrate their full potential through the Ultimate Kayak series, particularly the Ultimate Propel. If you are looking for the best fishing kayak, this may very well be the one for you! The Manta Ray kayaks by Native Watercraft coming in two distinct sizes have been the best selling fishing kayaks from Native Watercraft for some time. While newer more innovative designs like the Ultimate FX Propel have been very popular among fishermen and enthusiasts alike, the Manta Ray series has been around the longest. These designs offer a great accommodation for speed and storage and feature an open-deck design seen on many other Native Watercraft products. The Manta Ray features a very convenient transport wheel on the rear of the craft, which makes for easy out of water moving while minimizing abrasion damages and exertion. This fishing kayak has been offered in 12′ and 14′ varieties and has a capacity of 325 to 375 pounds. Native Watercraft products are available from select local dealerships but are hard to find in larger chain stores such as Bass Pro Shops or Gander Mountain. To locate a specialty dealer near you, take a visit to Native Watercraft’s Dealer Locator page on their website. Native Watercraft do not offer direct sales from their website but do so through Amazon.com—with nearly all of their products listed as available. When shopping for a fishing kayak, especially one as reputable as one from Native Watercraft, you are likely able to find the best deal if willing to purchase online rather than in a local store. Another benefit in purchasing these products online is the availability. Quality fishing kayaks such as these are fairly big-ticket items, and most local shops will only have a few in stock most likely due to high overhead cost. You can get a sense of overall brand quality in store, but likely would be hard-pressed to find all the different models to compare firsthand—unless you want to drive hundreds of miles from dealer to dealer! Native Watercraft specialize in fishing kayaks and the needs of anglers. Influenced heavily by the input from professional fishermen, these kayaks deliver robust features and quality rarely seen by competitors. Models such as Slayer, Ultimate FX Propel, and Manta Ray demonstrate this brands dedication to quality and performance.